For many INFJs, the feeling that we don’t stand up for ourselves well enough is a frequent one. We find ourselves in uncomfortable conversations that we don’t know how to leave, or we let people cross our boundaries because we’re not sure what to say, or we don’t speak up when someone assumes something about us that isn’t true. And then we feel guilty about it, but we aren’t sure how to change. For this post, we’re going to define “standing up for yourself” as sharing your ideas, choices, and opinions with others and not compromising on your personal standards, morals, or beliefs. You’re not obnoxious or dismissive of others when you “stand up for yourself” in this way, but you are honest and upfront about who you are, what you believe, and where your boundaries are. I saw Black Panther yesterday. So naturally today’s post is a new installment in the superhero Myers-Briggs types series. I know I get pretty excited about most of the MCU films, but this one is seriously good. I love the hero characters and the principles they stand for like loyalty and peace. The acting is great, the plot’s tight, I love the music (I’m listening to the score as I type), and while it still has a superhero-movie feel it doesn’t shy away from digging into some really deep and difficult subjects. Basically, you should go see the movie. And if spoilers bother you, see it before reading any further in this post. We are going to talk about key plot points and character moments. You’ve been warned. Okay, let’s start typing. T’Challa’s judging functions are pretty easy to pin-point: Fi/Te. But the fact that he uses Introverted Feeling and Extroverted Thinking when making decisions only tells us he’s either a TJ or FP type. We’re going to need a little more to go on than that. So what does this look like in real life? Let’s take politics as an example. Most of the people I’m around in real life are strong conservatives, but I’m also in contact with quite a few liberals online. I get to see arguments, news articles, and personal perspectives from both sides of the ideological divide. I see people who were vocalizing hate for Obama up in arms about how the liberals are treating Trump. I see people who told conservatives to get over it and be happy with Obama as their duly elected president protesting Trump in droves. I’ve seen conservative news articles vilifying Obama for his expensive vacations replaced by liberal news articles condemning Trump for the exact same thing. It just goes on and on and and both sides seem completely blind to the fact that they’re reacting in such similar ways. My Introverted Intuition lets me notice patterns like this. More than that, I can understand people on both sides without really feeling like I identify 100% with either (except on a very few individual issues). And that makes it hard to discuss politics with most of the people who want to talk about politics. If you’re trying to find some middle ground and encourage others to step outside their own perspectives, you might find both sides fighting you as strongly as they’d been fighting each other. There aren’t all that many people operating with Ni as their dominant mental process. According to the Center for Applications of Psychological Type, combined they only make up 3 to 7 % of the total population. Our minds don’t work the same way as most other people. That’s one reason we often feel misunderstood. 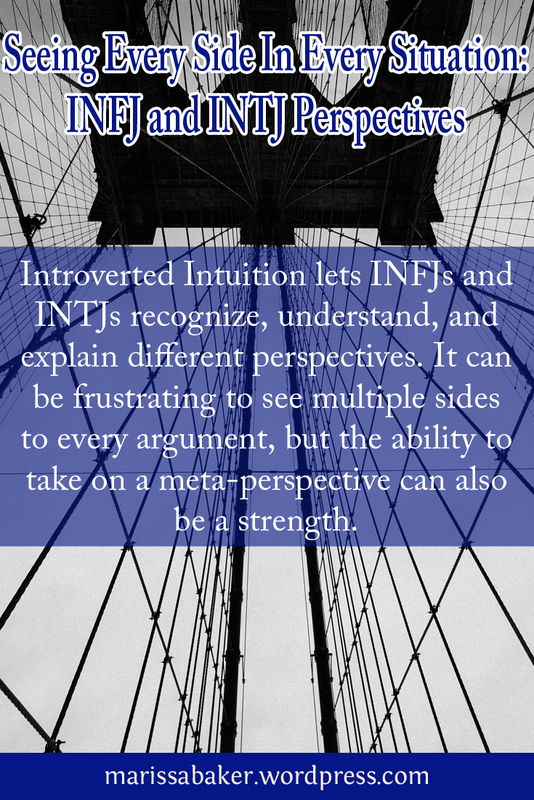 On top of that, our ability to climb inside other peoples’ perspectives gives us insight into others’ minds that not many people can match in return or even fully understand (though some ENFJs and ENTJs who’ve developed their auxiliary Ni, and maybe some ISTPs and ISFPs who use tertiary Ni, might come close). Our rather unique way of looking at the world can make us feel lonely and frustrated. We might feel like we don’t fit in with certain groups because we can also understand the perspective of the people they disagree with. We might have people reject us because we can only agree with them 75% instead of 100%. We might hide our true opinions or the questions we think about from the people we care for so they won’t feel like we’re attacking them. Most Ni dominant types are curious about how the world works. They want to ask questions to see where other people stand and understand different viewpoints. We like to throw out “what if …?” questions and see what happens. We’ll also play “devil’s advocate” in arguments to refine our thoughts on a given topic and help the person we’re talking with refine their’s. Other people can misinterpret these things as threatening to their own convictions or as an attempt to sabotage the status quo. I actually love this side of my INFJ personality. At least, I do now. When I was younger, I felt odd because I didn’t feel as firmly convicted about most issues as the people around me seemed. I felt that sharing my questions and voicing alternate opinions wasn’t encouraged. But my second quarter of college, I met a professor who actually encouraged me to write my questionings and unpopular viewpoints into my essays even when I completely disagreed with him. And he, and others, kept doing that for the next four years. 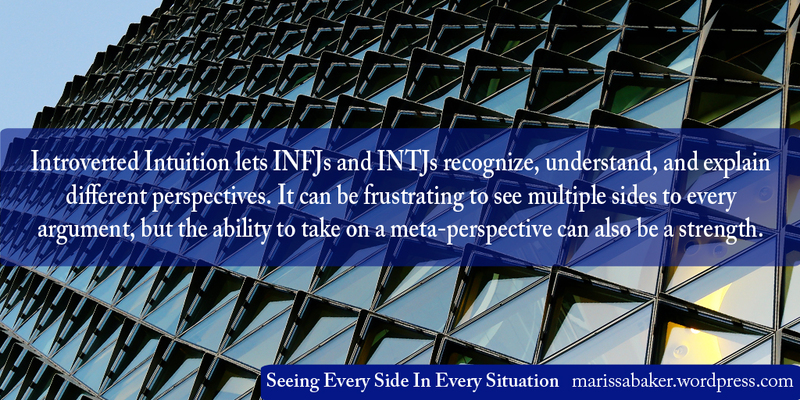 Some time after that is when I started getting interested in studying Myers-Briggs types, so I discovered this ability to adopt a meta-perspective is a natural part of my personality. Studying personality types also helped me understand why so many people see intuitive idea generation as threatening. Once I understood that, I could start phrasing my shared thoughts in a way that appealed to other personality types more. One of the great strengths of the Ni types is that we bring alternative perspectives to the table and we can learn to present these perspectives in a way that appeals to the different personalities. We have a gift that can help build bridges between people on intellectual and emotional levels. And that’s a pretty cool superpower. We’ve all gotten lost in thought and stubbed our toes or run into something because we weren’t paying attention (or is that just me and my friends?). But for some of us, keeping track of what’s going on in the outer world is actually quite a challenge. 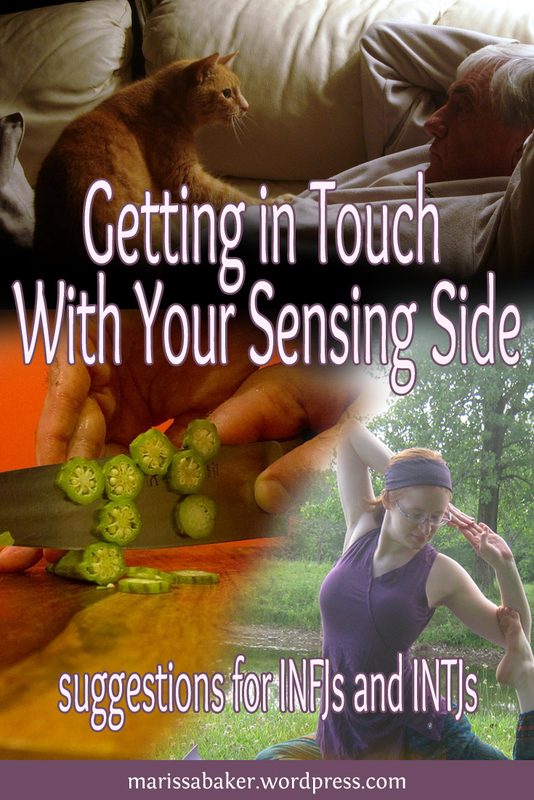 People who are Sensing types in the Myers-Briggs system are naturally “wired” to interact with the real world of sensory information, but Intuitives are more concerned with abstract thought and possibility. It can be quite a strength, but it has its downsides as well (perhaps there’s a reason only 30% of the population is Intuitive).